Comfort in the house is an important part of everyday life. A warm atmosphere is often created by small and inconspicuous at first glance details, which together give a long-awaited sense of coziness. And creating comfort in the house with their own hands. You can, of course, use the services of a designer. 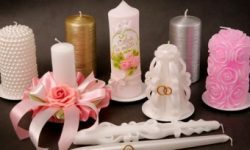 And you can create an interesting design with the help of handy things: glue and thread, giving the original color to the interior of the house. Having studied how to make a ball of threads, this is not difficult. How to quickly make balls of thread with your own hands? The house will look nice and unobtrusiveHanging thread balls. They can be made in any color and size. They will harmoniously fit into the interior, if you hang them on the ledge or in the corner chill out, decorate the space around the dining table or on the loggia. 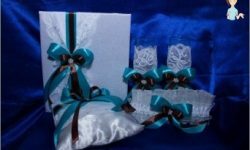 In addition, such an interior detail will costYou in a mere penny, and the time to manufacture items will be spent at a minimum. Such balls are a great way to quickly decorate a room for a festival. 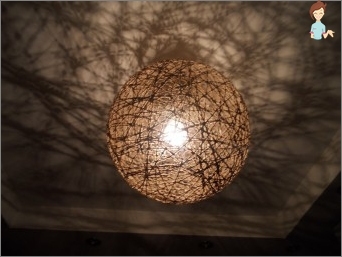 But not only from threads it is also easy to make a new lampshade or plafond to an old and boring chandelier. A quick and optimal way to please the family andFriends New Year's atmosphere - is to create a snowman, with - absolutely without snow! So, how to make a snowman out of threads and balls and what is needed for this? Spangles or stars (for decoration). We inflate balls. All three must be of different sizes, and the last two (for the hands) are smaller than the others. 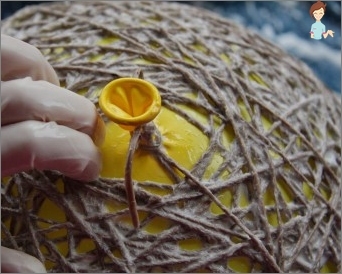 Degrease the surface of the balls so that the thread on the glue does not slip and falls well during the removal of the base. Pour in the bowl of glue. Threads are dragged through it so that the entire surface of the fiber is sticky. Gradually tightly wrap around the circle balls from all sides. Suspend to dry out. At this time, you can sprinkle them with sequins and varnish. 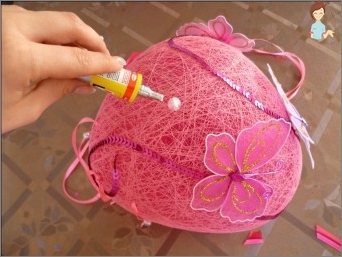 Slowly, so as not to break the fragile construction, blow off the balls and take them out of the thread spheres. We connect them all together with glue. To the top of the snowman glue beads-eyes, and along the body of the snowman we catch beads-buttons. Make your own hands Christmas decorationThe snowman is simple, but you can place it anywhere: put it on a Christmas tree, put it on a window sill, or hang it at the entrance of an apartment. Fast and original decor at no extra cost! How quickly from a string and a ball to make a chandelier? In addition to the snowman, with the help of glue and improvised means, you can also update the permanent decor in the house. 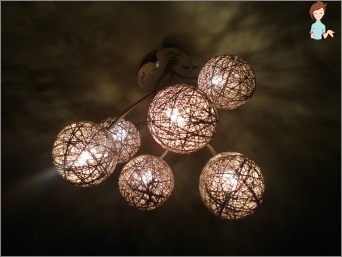 For example, you can make a new chandelier in your bedroom or living room with your own hands. Thread (thicker, knitting threads are quite suitable). We inflate the ball as much as possible. The plafond will look more spectacular, if it turns out to be voluminous and not get lost on the general background. Pour some glue into the container. We thread the thread in a needle and drag it through the glue with the entire surface of the fiber. Tightly wrap the ball thread. We leave to dry in a suspended state. Blow off and separate the fragile frame. We hang a chandelier on a light bulb and, voila, a new lamp is ready! It is worth noting that a similar chandelier can be madeNot only hinged - such a plafond looks comfortable and on the bedside lamp. In addition, ceiling lamps with several light bulbs can also be updated in the same way. However, in this case, the ceiling should be small in size. 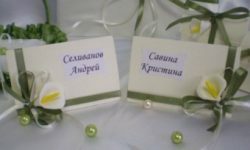 If the interior of the room requires it, small decorating elements, for example, a butterfly made of thread or other material, can be glued to the plafond. They can also be made by themselves. How to make a thread from a ball and a lampshade? Many homes still have a good oldfloor lamp. Light radiates scattered and warm, but the shade is already pretty worn out. Buy a new expensive, and there is no point. Therefore, the most effective way to improve the old floor lamp is to use a balloon and glue to create a new lampshade with your own hands. 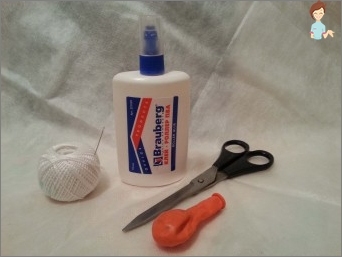 To do this, you still need a bit thickGlue, degreasing agent (can be replaced with petroleum jelly), a large needle, a container and a balloon (but in this case you can use not only round, but also pear-shaped.) And avid lovers of romance can take a ball in the form of a heart). We dress on a light bulb and ... enjoy a warm home light! 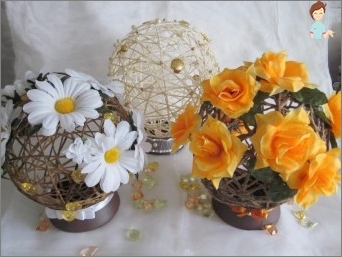 If you use a large ball, then theThe construction can be made not only in the form of a sphere. To do this, carefully cut the already dried frame in half. We cut off the edges with curly waves. To the edges, you can also attach silk tassels, like a real retro torch. However, in this case, you will have to take care of an additional metal structure on which the lampshade will be mounted. Between him and the light bulb there must be a gap.